One of the most exciting new technologies in holistic medicine is the use of far infrared radiant heat (FIR) in treating a wide variety of illnesses, diseases and conditions. What is far-infrared radiant (FIR) heat? Also known as radiation heat or infrared heat, Far-infrared radiant (FIR) heat is a narrow band of energy within the 5 to 15 micron level that is naturally occurring. FIR heats objects with direct light conversion – a process that can penetrate deeper into the object – but does not increase the surrounding air temperature. On humans, FIR heat is completely safe and can permeate 2 to 3 inches deep into the tissues, where it is believed to increase blood circulation and encourage tissue repair. Infrared heat is not visible to the human eye, but scientists have created cameras which can register this spectrum of light. How is Far Infrared therapy administered? Far infrared therapy is used in medical, dermatological and rehabilitation clinics all across the globe. The therapy is administered via lasers systems, heating pads, heat belts or braces, and with far infrared saunas. EM-X® Ceramics infrared jewelry are a practical and convenient method of applying day-to-day infrared therapy. What is far-infrared radiant therapy used to treat? 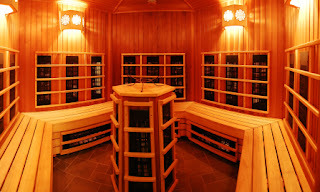 Far-infrared radiant heat increases blood flow to the treated area. The increased oxygen and nutrient supply relieves pain, diminishes joint stiffness, stops muscle spasms, reduces inflammation, and speeds healing in the damaged tissue. This treatment is especially effective on sprains, strains, bursitis, peripheral vascular diseases, arthritis, chronic joint and muscle pain as well as a variety of soft tissue sports injuries. Radiant heat also promotes muscle relaxation which increases comfort, reduces stress and induces sleep. Studies have shown that exposure to FIR for 1 hour can also significantly reduce blood pressure. Far infrared heat is believed to increase collagen production, reducing wrinkles and signs of aging. The Smoothbeam and CoolTouch infrared laser systems are commonly used to treat acne. The beams emitted from these devices shrink the sebaceous glands and virtually eliminates acne. Far infrared can also be used to open pores for deep skin cleansing and aesthetic purposes. Studies in Japan and Sweden have concluded that far infrared radiant heat counters the negative effects of electromagnetic fields emitted from man-made structures like high-tension power lines, cell phones, and computer display terminals. Far infrared heat has been used to successfully treat gum inflammation, tooth pain, and muscular spasm. Many Japanese dentists use far infrared treatment on a regular basis for gum inflammation and pain suppression. Examples are the EM-X® Ceramics used in Dr. Don's® products. How can far infrared therapy be used to treat so many seemingly different ailments?! It is believed that far infrared therapy may enhance white blood cell function, improving over-all immune system functionality. Couple this with the treatment’s anti-inflammatory properties, and it really can be applied as treatment to a countless number of injuries and diseases. Microbial inoculants are one of the most versatile and fascinating eco-friendly treatments currently available to the American household. Also commonly referred to as a soil inoculant or bioremediation bacteria, these compounds use beneficial microbes to restore imbalanced environments to a natural, life-supporting state, promoting environmental health on both the micro and macro levels. Those who are familiar with microbial inoculants often think of them as agricultural fertilizer amendments that promote healthy, robust yields and drought resistance. This is by far the most popular use for microbial inoculants, but there are a myriad of additional applications for both inside and outside of the home. The following are the most common outdoor uses for microbial inoculants. The best known use of microbial inoculants is as a soil amendment, conditioner or biofertilizer. Microbial inoculants are frequently used in commercial agricultural – especially organic farming – but also yield fantastic results in home gardens, lawn maintenance or greenhouses. A microbial inoculant promotes beneficial soil microbe communities by contributing high levels of polysaccharides, and beneficial organic acids and/or enzymes. This, in turn, enhances aggregate stability and soil structure. A strong soil structure prevents the pore spaces in the soil from collapsing during heavy rainfall, decreases over-compaction caused by machinery, and reduces soil erosion and run-off. The result is a stable and well-formed soil aggregate that is more resistant to disease, more capable of absorbing and retaining moisture, and more efficient at cycling vital nutrients. Microbial inoculants have also been known to enhance crop productivity by stimulating plant hormone production. Microbial inoculants can also be used to treat water in outdoor water features, ponds, reservoirs, rivers, oceans and industrial waste-water plants. Water environments can go out of balance due to pollution, algae, stagnation, mosquito infestations and the like. A microbial inoculant treatment can keep the environment balanced and even correct a hazardous environment by increasing the beneficial microbes. These organisms will keep nutrient levels low enough to keep the water clear, and can also neutralize salts, such as calcium, preventing crystallizing on surfaces. It is an environmentally sound and cost effective method for maintaining your water environment’s health. In fact, the use of microbial inoculants in industrial waste-water facilities has been proven to decrease overhead by reducing chemical inputs, electricity costs, labor costs, and factory maintenance. Microbial inoculants can also increase compost and anaerobic fermentation efficiency, speeding along the breakdown of organic matter and the compost process in general. In these instances, the beneficial bacteria convert organic materials into humus, binding nutrients to create a rich organic humus biofertilizer for plants that is safe, organic and enhances the plants’ resistance to stress and reduces soil borne pathogens. Likewise, the microbes produce enzymes, bio-available trace minerals, antioxidants, vitamins, and support other naturally occurring microbial communities. The result is an efficient, healthy compost pile that produces less smell, attracts fewer pests, and significantly reduces disease-producing pathogens resulting from compost putrefaction.